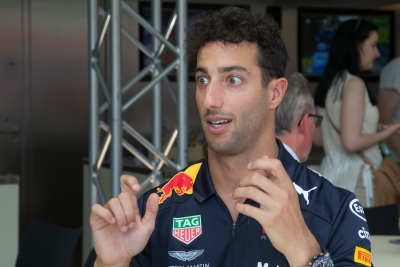 Singapore Sep 14 (IANS) Red Bull s Australian driver Daniel Ricciardo and Dutchman Max Verstappen were the two fastest people ahead of Ferrari in the first practice session of the Singapore Grand Prix on Friday. Ricciardo was the fastest recording a time of 1:39.711 followed by his Dutch teammate who came in at 1:39.912 ahead of the two Ferrari drivers Sebastian Vettel of Germany and Kimi Raikkonen of Finland reports Efe. Germany s Nico Hulkenberg (Renault) came in fifth whereas current world number one Britisher Lewis Hamilton (Mercedes) came sixth at the Marina Bay Street Circuit. The qualifying session for the Singapore GP will take place on Saturday ahead of the race on Sunday.